Brothers Pete and Tom Swift grew up on the Balboa Peninsula and have been around the water their whole life. Pete, a UCLA graduate with a business degree, was selling life insurance in the early eighties and wasn’t satisfied. “I wanted to be selling something tangible, something you can see…something I could be proud of.” When a repair job on a dock for a girlfriend’s father gave Pete the sense of accomplishment and enjoyment he was looking for, he began looking for work doing dock maintenance, painting or whatever came his way. 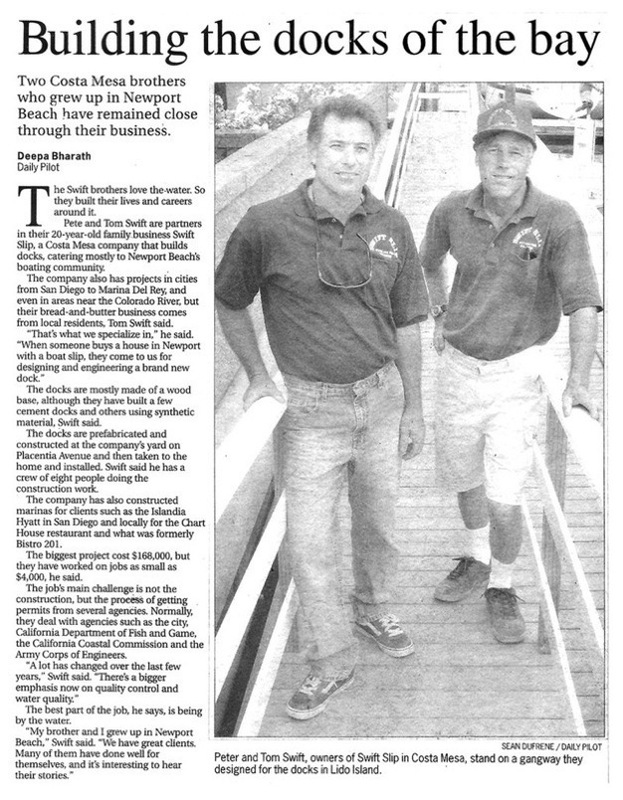 A year later, Pete and Tom, also with a degree in business, joined forces as co-owners of Swift Slip and set out to make a living on the water. Swift Slip has moved several times due to positive growth in business. Beginning in their brother Ken’s garage, they soon moved to their first yard in Huntington Beach, then to Cannery Village in Newport and eventually to Swift Slip’s current location in Costa Mesa. With projects from San Diego to San Francisco, Pete and Tom’s hands-on work ethic is the foundation that drives Swift Slip forward. This work ethic is evident in the crew they employ. Swift Slip’s crew prides themselves on being the most professional workers on the water. 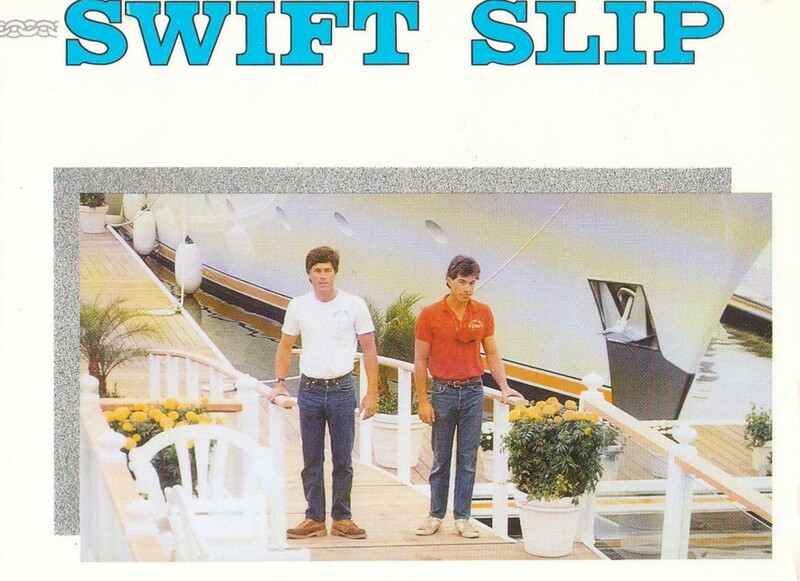 With over 30 years of experience Swift Slip has the “know-how” to do the job right the first time and prides itself on building relationships with customers that last well beyond the life of a dock – something to truly be proud of. Here you can find the various services Swift Slip provides. Q: What are the choices I have when it comes to decking? A: We have 5 main materials that we use for decking and those are: treated Douglas Fir, TREX composite, Pau Lope/IPE Brazilian hardwood, Sun-miser, and the fiberglass decking. You can learn more Here. Q: What are the choices I have when it comes to a gangway? A: There are many different decisions to make when it comes to a gangway. You can decide what material you want for the decking, the size, the railing, and the material of the actual structure. You can learn about our 5 main gangway types Here. Q: What makes a dock sturdy and firm? A: A rigid frame with tortional resistance and more than adequate flotation will keep your dock sturdy. We use super floats by Ace Rotomold to keep flotation strong. Q: How are the pilings installed? A: There are two methods: 1.) Wet drive which uses water to jet a hole in the bottom, and the other 2.) is Dry drive, where we hammer the pilings into the ground which is usually a steel pipe piling. Q: How big of boat can I fit in my dock? A: Every city has different rules on whether your boat can extend passed your slip. But, Newport Beach will allow you to have your boat past your dock. Huntington and Long Beach allow 10% of the boat length to extend into the channel. Therefore, every condition varies. Contact us at info@swiftslipdocks.com for your specific situation. Q: What’s the deal on permits? A: The procedure to pull a dock permit is a long, difficult process which varies from city to city. We provide the service for you at an extra cost. However, with over 30 years of experience, we are going to help you get the dock that you wish for. We have worked with the cities for years and know how to pull a permit in the most time efficient and effective way. However, we cannot promise a certain time limit. Permits can take from just one week up to one year to pull.